This new book examines the current derivative law in China, and how it could be improved by comparing it with the relevant law in the United States and the United Kingdom. Derivative actions, which allow individual shareholders to sue controlling shareholders and managers on behalf of the company, are designed to deter and combat mismanagement. But the need to balance the interests of minority shareholders and corporate efficiency in a country’s company law demands legal crafting that is both of a high order and responsive to the country’s distinctive character, and solutions in this respect are quite different across jurisdictions. 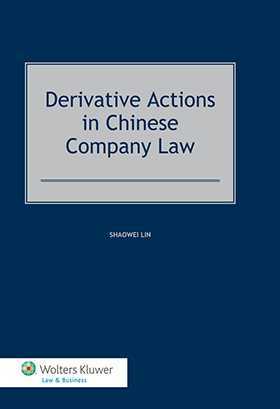 The author shows you why derivative actions in China need to be strengthened and improved, and how this would help lawyers working in this area. The author examines China’s derivative action cases from 1993 to 2013, some of which have never appeared in the courts. His interpretation of these will provide you with invaluable perspectives on the Chinese system’s characteristics, successes, and failures. Along with in-depth analysis that enriches the current legal scholarship on China’s derivative action law and practice, you’ll find authoritative guidance on crafting effective substantive and procedural rules. The author also proposes a new legal framework for the Chinese system. Legal academics, and companies and their counsel doing business in China will find this book essential reading. CHAPTER 2 The Need of Enhancing Derivative Actions in China. CHAPTER 3 Derivative Actions in China. CHAPTER 5 Making Derivative Actions Work in China: The Funding Issue. ANNEX I Derivative Actions Cases Prior to Company Law 2005. ANNEX II Derivative Actions Cases after Company Law 2005.